This tutorial gives an overview of the WITS site and also on TradeStats database that provides aggregate trade, tariff and development indicators. 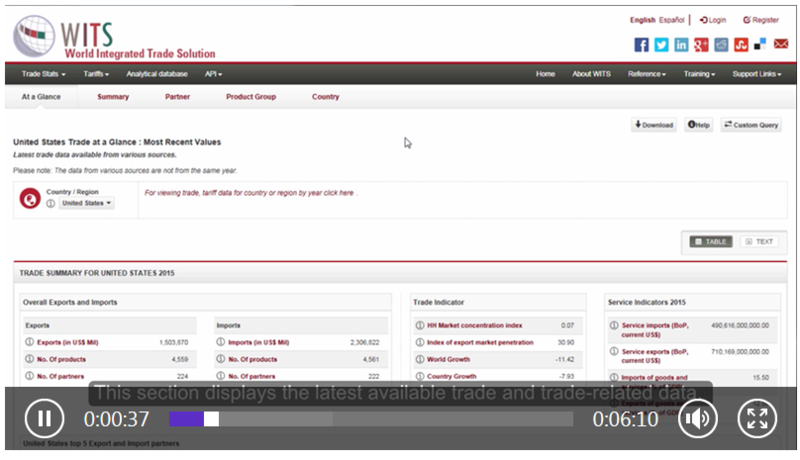 This video walks you through details on how to use WITS TradeStats database to obtain a country's trade, tariff and development indicator. 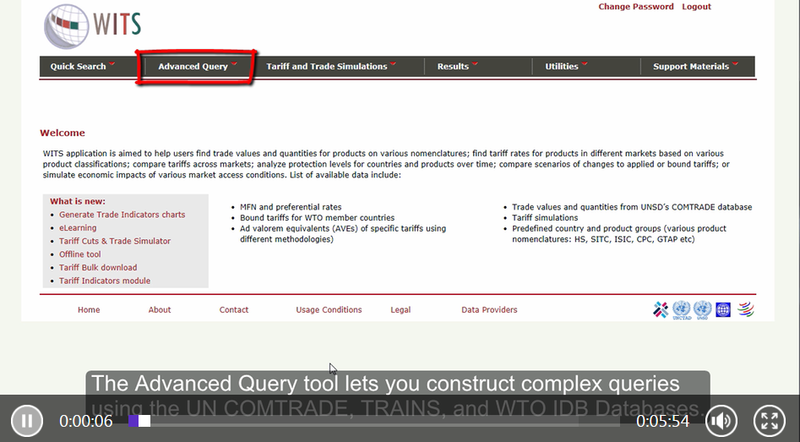 The Advanced Query tool lets you construct complex queries using the UN COMTRADE, TRAINS, and WTO IDB Databases. 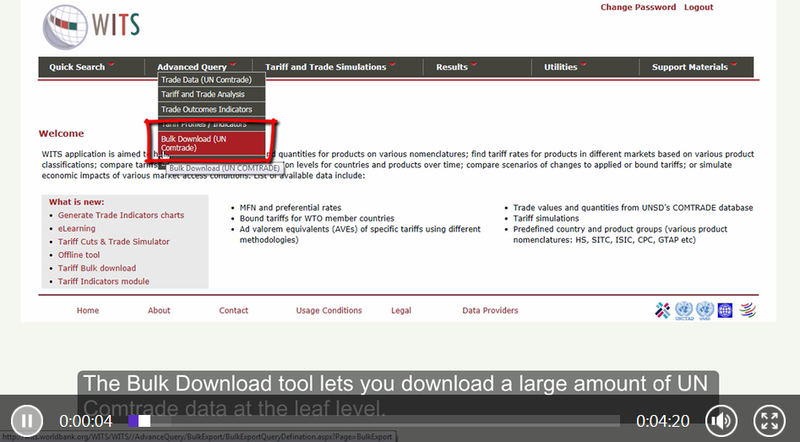 The Bulk Download tool lets you download a large amount of UN Comtrade data at the leaf level. 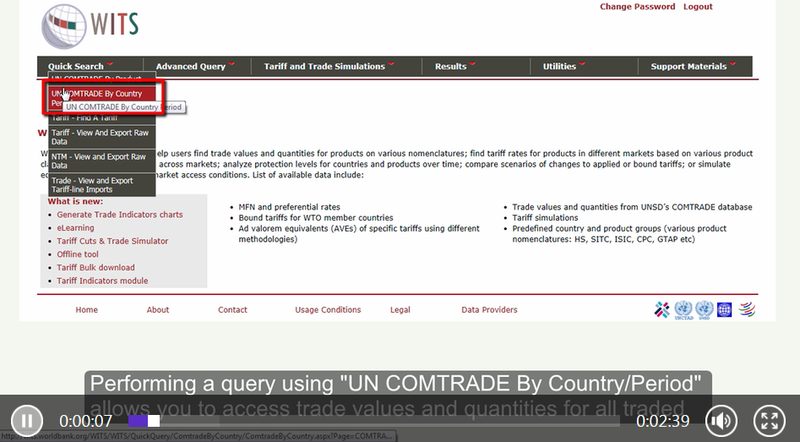 Performing a query using "UN COMTRADE By Country/Period" allows you to access trade values and quantities for all traded products for one reporter country, one year, and one or all partners. You can use WITS to conduct simple queries efficiently by scrolling to the “Quick Search” tab. 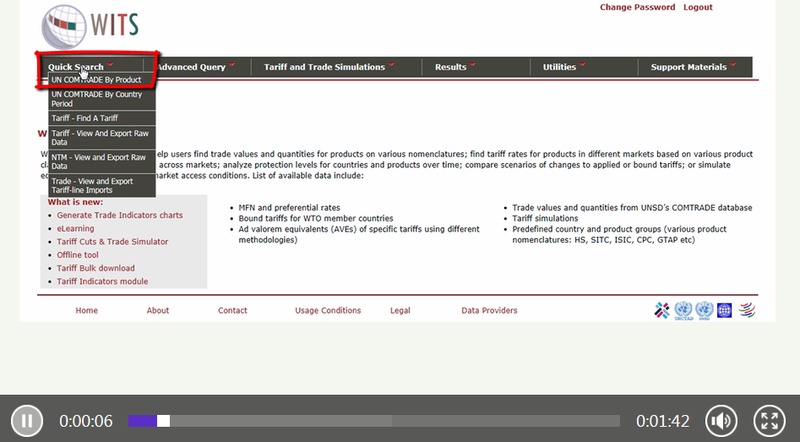 The “Trade – View and Export Tariff-line Imports” tool lets you query available databases and retrieve tariff-line imports of all traded products. 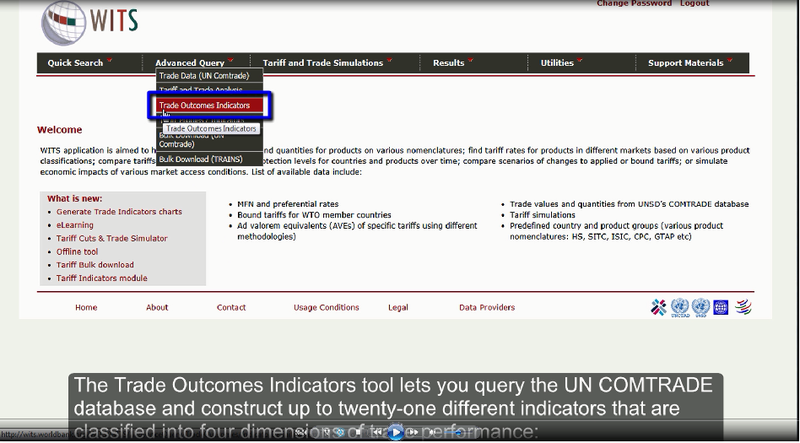 The Advanced Query – Tariff and Trade Analysis tool lets you access data on multiple tariff types and rates from UNCTAD and WTO databases. The Bulk Download tool lets you download a large amount of data for both Preferential and Most-Favored-Nation (MFN) rates from UNCTAD’s TRAINS database at the 6-digit level of the Harmonized System. The Tariff Profiles tool lets you quickly access MFN Applied tariff rates and associated import statistics in the UNCTAD TRAINS database. The “NTM – View and Export Raw Data” tool lets you query the TRAINS database to retrieve data on non-tariff measures. The “Tariff - Find a Tariff” lets allows you view tariff rates by selecting from one data source, one market, one year, and one or all duty codes. The "Tariff - View and Export Raw Data" tool lets you query available databases and retrieve duties applied to all countries. 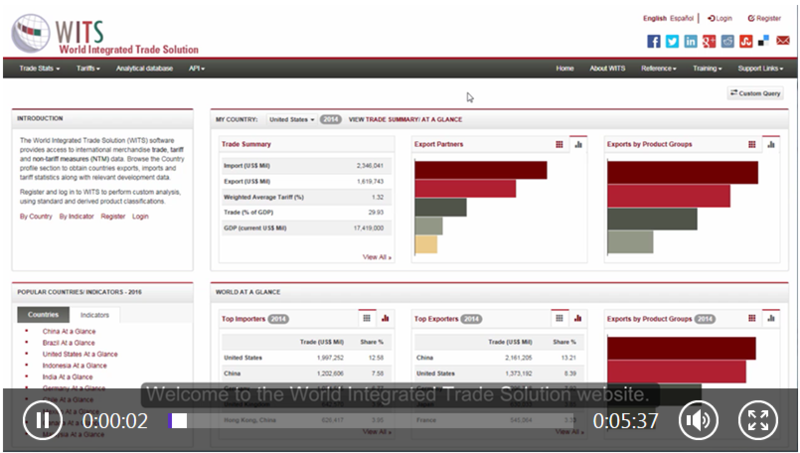 This tool is also useful for comparing rates of various trade agreements.